Billy Godleman's defiant 59 was in vain, as Essex Eagles claimed victory at Castle Park Cricket Ground, Colchester. An outstanding 88 from Ravi Bopara led the way for the home side, before timely contributions from James Foster (41) and Graham Napier (23) helped the Eagles post 259 off 40 overs. The Falcons lost five early wickets in reply, with only Godleman (above) and Alex Hughes (28) hitting scores worthy of note, as Karl Krikken's side were dismissed for 151 in the 32nd over. Essex's total was built around an excellent innings from England all-rounder Bopara. The 28-year-old smashed six fours and three sixes in his run a ball 88, to guide the hosts from 33-1 to 187-5 in the 35th over. The Eagles then added 72 runs in their final five overs thanks to the hitting power of Napier (23) and Foster (41). Napier blasted two fours and two sixes in his 10-ball vigil, while Foster stuck five fours and a six in his 24-ball innings to help Essex post 259 from their allotted overs. Derbyshire, however, struggled at the start of their reply, losing regular wickets - two apiece to Tymal Mills and Tim Phillips - to be reduced to 52-5 in the 13th over. Godleman and Alex Hughes shared an excellent sixth-wicket stand to drag the Falcons back into the contest. Together, the pair added 52 runs in 8.1 overs before Alex Hughes was finally out for a brisk 28 off 30 balls. Wainwright joined former Essex man Godleman in the middle and together shared a 37-run stand to keep the visitors' faint hopes of victory alive, but he was removed for 17 in the 29th over with the Falcons on 141-7. Godleman completed an excellent half century shortly after - including six fours - but his superb innings was ended on 60 when he was bowled around his legs by Reece Topley. And the visitors quickly lost their last two wickets to be all out for 151 and hand Essex a 107-run win at Colchester. 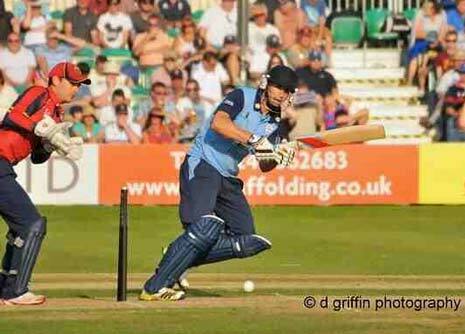 Derbyshire are back in action tomorrow when the Falcons welcome Hampshire Royals to the County Ground (1.45pm start). Derbyshire County Cricket Club Members are invited to bring two guests to the Yorkshire Bank 40 match on Bank Holiday Monday, 26th August - for FREE! Members can bring two guests into the ground for FREE simply by showing their card on the gate and introducing their guests. Accompanied kids can also come to the fixture for FREE thanks to a nationwide promotion from the England and Wales Cricket Board. Supporters who buy tickets in advance will benefit from discounted prices of £12 adults, juniors FREE and £4 car parking; available online at https://www.dccctickets.com/ or by calling 01332 388 101. A further £2 discount is available per adult ticket for a group containing four or more adults. Tickets are also available on the gate priced at £16 adults, juniors FREE and £5 car parking.